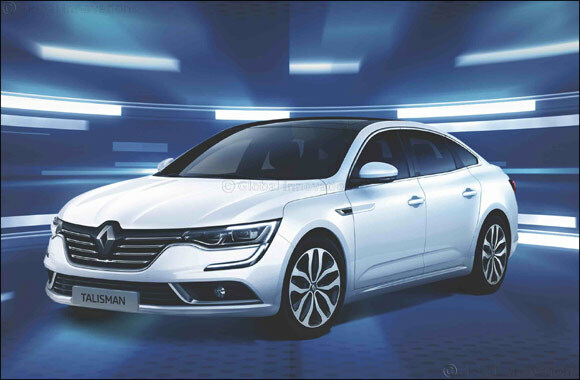 Kuwait – 13September 2018: Abdulmohsen Abdulaziz Al Babtain Co., the authorized agent of Renault in the State of Kuwait is pleased to announce its latest offer on the Renault TALISMAN, known for its sporty edge and flare for luxurious rides. Designed to fulfil customers drive for the perfect blend between comfort and high performance on the road, the dynamic saloon car offers a 10 year warranty and comes with a starting price of KD 4,999. Offering well-balanced, generous volumes, the TALISMAN serves as the right fit for customers seeking optimal practicality, enjoyment and premium led experiences through its electronic damper control for outstanding on-road dynamics, a class-leading energy TCe 190 turbocharged direct-injection petrol engine, with 190hp on tap, fuel consumption and CO2 emissions of as low as 17 km/liter and 139 g/km respectively. With a special focus on personal well-being, the TALISMAN offers a spacious cabin with perforated, quilted leather seats that contain the class’s most comprehensive list of functions (air conditioning, massage function, heating, ventilation) in the front and a boot of a capacity of 608dm3 (VDA) combined with a sleek exterior profile. Moreover, the vehicle contains an 8.7-inch touchscreen display, exclusive BOSE surround sound with 13 speakers , color head-up display, a cowled 7-inch digital instrument display, easy hands-free trunk access, smart hands-free entry system and a comprehensive range of driver aids including hands-free parking and blind spot warning. Ensuring a customizable and intense driving experience, the TALISMAN guarantees a conveniently accessible MULTI-SENSE technology and an intuitive R-link 2 tablet that offers a big-screen multimedia feel and full control of the on-board technology. Drivers can engage the car in accordance to their mood by simply choosing one of five different modes, from sport to comfort mode. Renault Kuwait encourages its customers to visit the showroom situated in Al Rai and avail of the opportunity to explore a world of exciting features that come with the TALISMAN.